Have you ever eaten a flower? I distinctly remember the first time I ate one. I was probably in elementary school and my father served some sugar-dusted, sweet rose petals as a desert. At the time, I thought he was crazy, but it definitely made an impression! It also probably planted the seed for my love of gardening and herbology. Since then, I’ve had a range of culinary experiences with flowers. I’ve enjoyed tasty drinks made with flowers, such as chamomile tea, red wine with rose essential oil, lavender lemonade, and hibiscus tea. I’ve also added borage and pansy flowers as a special garnish on cakes and tossed in nasturium flowers to salads. In addition, I’ve taken pleasure in eating rose jam and rose-water infused baklava. In spite of all these floral adventures, I realized my experience with actually eating flowers in entrées is rather limited. So, I wanted to find some great resources for how to select and cook with edible flowers, especially since a recent study showed how eating certain kinds can prevent chronic disease and promote health as I discussed in this recent post. I not only found some helpful articles and books and delicious recipes, but along the way I discovered edible flower seed suppliers and growers! 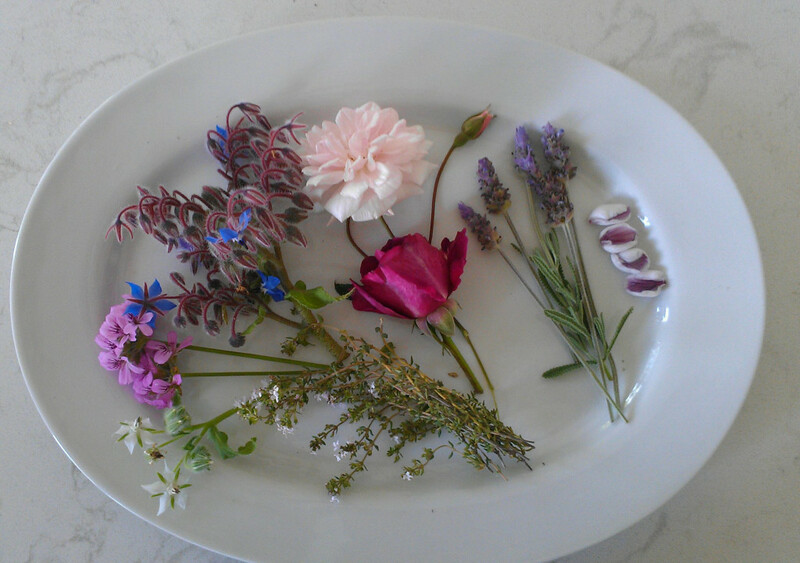 Read on to get started on your journey to cooking with edible flowers. I found this article by What’s Cooking America helpful, because it talks about how to choose edible flowers and also has an edible flower chart. Another great article was this one featuring edible flower tips and hints, which mentions how asthmatics should avoid some flowers. It’s amazing how many great recipes you can find on the internet, but here are a sampling of some that not only look pretty, but I thought sounded delicious. They all use common flowers that you should be able to get from your own garden, special order (see last section below), or buy in the marketplace (e.g., squash blossoms, hibiscus flowers, dried lavender). Don’t they sound tasty? Planting your own edible flower seeds is fun and ensures that the flowers are fresh and organic — which most likely translates to a higher antioxidant value. Aside from browsing through your local garden center, you can also shop online. There are many options on Amazon, such as the “Cooks and Gardeners” Edible Flowers to Grow and Eat Seed Packets by Botanical Interests (1st photo below) and this Edible Flower Mix of 12 Varieties (500 Seeds) (2nd photo below). Just as you can order a flower bouquet, you can also order some fresh edible blooms! Melissa’s and For the Gourmet sell assorted flowers that would be great if you plan on cooking a flower feast for a special occasion, such as a bridal shower. But you do get quite a few, so you may want to share them with friends! Well, what do you think? Do you plan on cooking with flowers? Please feel free to share any great recipes you may have. I love cooking with edible flowers! I have a recipe on my site for Honey Coconut Ice Cream with Edible Flower Topping that is so tasty! Adding these colorful flowers into your cooking can really add some great health benefits and flavor too! Thanks for sharing this info. Thanks for stopping by. That ice cream recipe with the edible flower topping sounds divine! Is it it dairy free? Very educational! I must say I have never eaten flowers before. Acutally I did not realize you could do such great things like this with flowers. I may have to give this a go. Thank you for sharing. I purchased some lavender over the weekend and, because I had read this post, picked up some extra to add to our meals. I was pleasantly surprised by the taste and will look into cooking the Blueberry Lavender Pie. Hello Rachel. Let me know how the pie turns out! I should do the same as my family loves blueberries, too. Yum! We’ve eaten dandelion, rose, clover and lilac blossoms, but there are so many more we can try! Our growing season is short here in northern Alberta, and this year spring is even later in coming. I haven’t even seen a single dandelion yet! I’m looking forward to the time when I can try some different varieties of edible flowers. Hi Willena. I hope spring is just around the corner for you and you see those flowers emerging soon! Hi Shelley. So glad to hear that you like cooking with edible flowers. That ice cream recipe sounds fantastic! I’m going to check it out for sure! You have provided me with an ideal solution. I have two places to grow my edible “crops’, on a sunny balcony and in some raised garden beds. I wanted some colorful flowers on my balcony as well as herbs. Now I am going to plant edible flowering plants instead and have a mass of color. The plain herbs can be relegated to the garden. My mom used to do this all the time, now my mouth is watering just reading this post! Our family especially loved rose buds and bluebells. I’ll try to use this post to try to convince my wife to try edible flowers. Thanks! I’ve never eaten flowers in any type of dish but I did buy a book from one of the eccentric stores in Salem, Mass that used flowers in the recipes. I never did use it but the recipes were so intriguing..
I’ve never eaten flowers. I’ve seen them used as garnish for entrees. It does makes sense that you can eat some…. as I’ve got friends who do that. I may have to try some of these now. I have to say I’ve never tried it.. and the thought of it really isn’t easy to say yes to.. I’d have to do some changing mindset to eat some flowers… Just sayin, i’m sure I might enjoy a few, but the thoughts of it really cause me some trepidation!! I’ve eaten dishes with edible flowers – in fact there’s a lavender farm here that has a lovely cafe with all sorts of dishes with lavender. But it never occurred to me to cook my own and I had no idea it was possible to order edible blossoms! You’ve really inspired me and I definitely plan on looking into this further. Thanks! Thanks for reminding me of the joy..
nick catricala recently posted…Follow Me…. Hi Karen! What a fun idea. I’ve never thought to bake or cook anything with flowers, but I love the idea. Thanks for the inspiration and beautiful pics! Yum! Although I have had flowers served with dishes that I have ordered in a restaurant, I have never eaten them. I thought that they were placed on the plate to make the dish visually appealing. I don’t see myself cooking with them; however, the next time they are served when dining out I will give them a try (after confirming that they are edible). Rachel Lavern@Online Biz Boomer Babe recently posted…Is It True or Just What You Believe? I’ve eaten organic flowers and have added them to a salad! Wow….they are delish! Now I know more varieties to choose from. I usually purchase them at farmer’s markets. When I do…they make a great snack also. Hello Karen, Now this is a different kind of an article, Wow Eating my flowers, it sounds funny. I am excited to give it a try though, I think it will be fun, I have a houseful of flowers but none of them are eatable! Chery Schmidt recently posted…The Benefits Of What’s In It For Me! Hi Chery. Thanks for your comment. Yup, eating flowers is definitely different, but it can be so fun! And flowers really make any kind of food or drink extra special. Let me know if you get a chance to try any good recipes and what your grandsons think if they get to eat flowers!